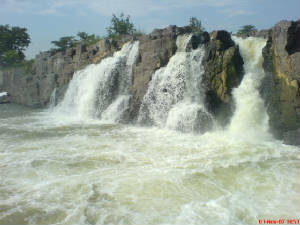 It is a beautiful waterfalls of river Kaveri situated at around 180 km fom Bangalore. Tamil is the running language there and people know kannada also a bit. The river falling into a narrow gorge in several bursts of water. There is no wide open space where you can stand and watch the fall. 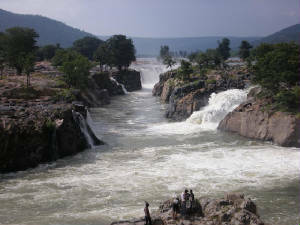 You need to hire a coracle (Teppa) and get right into the falls which is around 1 km to be able to see it. The boatmen say that the depth of water while going to the falls is around 100ft. The boatmen can take you really close to the falling water, sometimes to make the water splash into you if you wish. You can even try rowing the boat. They will tell around 500 rs per trip, obviously you can bargain upto 300 rs. But they are pretty smart businessmen and they know you wont go back easily withour seeing the falls after coming all the way till here ! You can find kids showing their diving skills into the channel. The after monsoon time would be great to visit there. The waterfalls is simply amazing. No food is available except some small stalls. It is advisable to visit there within 11pm or after 4 pm to enjoy the falls to the fullest. members: praveen, ganapati, lohith, subbu, vasudha, shruthi, varna, soumya. Tripping is a disorder. beware !